Welcome back to Academic Writing – our series that gives you the tools you need to write successfully as a student. It's exam time! Let's take a look at the challenges of doing exams and formal assessments in English. "The best way to prepare children for later life is to expose them to a range of competitive activities in schools from an early age." To what extent do you agree or disagree with this statement? Provide reasons and examples to support your answer. Can you identify 1) the key words in the essay question above which will help you to plan your answer? and 2) the type of essay you need to write? You can check your answers – in an activity – next. 'The best way to prepare children for later life is to expose them to a range of competitive activities in schools from an early age.' What are the key words to determine the topic of this exam question? 'To what extent do you agree or disagree with this statement? Provide reasons and examples to support your answer.' What kind of essay do you have to write? So, you're in the exam and you've finished your answer. That's it, isn't it? No! 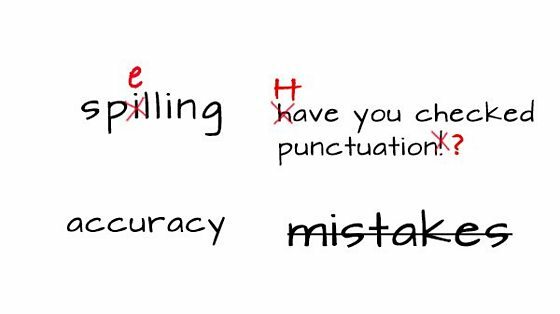 You need to make sure to proofread what you've written in case you've made any mistakes. Do you know what kinds of mistake to look for? Here are four top tips! Before the exam, you should memorise and practise spelling words that you always find challenging. You could do this through repetition exercises by writing the word over and over and over again – or you could also try remembering how to spell tricky words through mnemonics. No English Child Eats Sandwiches, Some Are Really Yuck. Did you get it? The first letters of the words in that phrase spell necessary. When you've finished your exam essay – check your spelling. Focus on words you know you have trouble with. You should also make sure to check punctuation. This includes capital letters, full stops and commas. If you haven't let a gap between your paragraphs, have you indented it? Indenting is where you leave a space to show where a new paragraph begins. Have you made good use of prepositions? Does the preposition match the adjective you’ve used? Have you used the gerund or the infinitive correctly? Have you use the simple where you need the continuous? You should try and use a range of complex sentences in your essay. This not only helps you to express your ideas more economically, but it also displays a better understanding of the language. Ensure you revise how to build complex sentences! This can include things like conditional sentences and subordinate clauses. If you do make a mistake during the exam, just put a line through it. Anything with a line through it will not be marked by the examiner. This goes for your plan too! You won't be allowed to use correction fluid, so a simple line is fine. By spending a few minutes checking your work, you'll be able to spot obvious and silly errors that may result in losing marks. How did you do? Now that you've understood the question, it's time to plan and write your essay. Go to the next activity to find out more.